When my best-friend, Stephanie, suggested we take a boat down the river circling Strasbourg, I felt a twinge of reluctance. 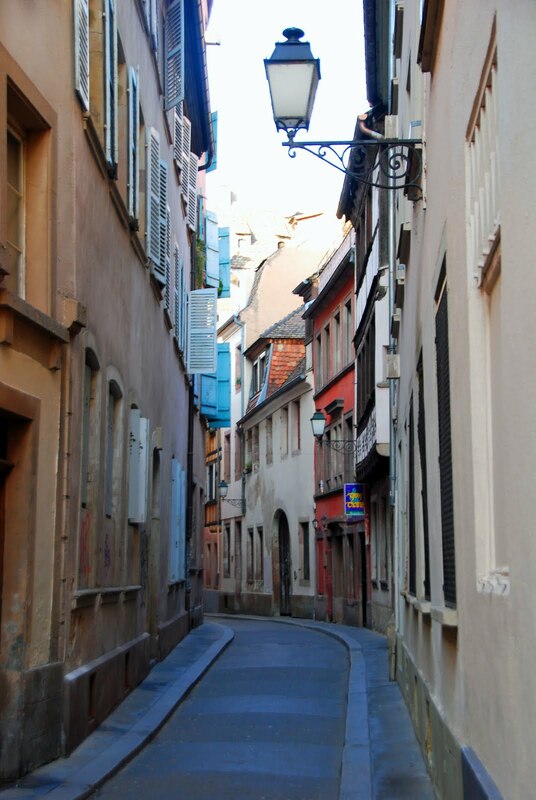 We had just arrived and already the city was calling to me to walk its streets and discover its many hidden secrets. I wanted to explore the stone towers, timbered houses, narrow alleys, and hidden courtyards, not sit on a boat with a gaggle of photo-snapping tourists who had no respect for history. I have discovered in my travels that some places emit nostalgic vibrations. I can't describe it, really. The air just seems heavier and laden with spirits. Strasbourg was emitting that strange vibe. I could feel spirits in the air. I paid for my ticket, took a brochure, and walked down the gangplank behind a boisterous group of Spanish tourists. Once on board, I plopped down on a molded plastic seat near the window and silently prayed the journey would not take too long. As I waited for the tour to begin, I looked out the window at the neat row of timbered houses lining the river and wondered what sorts of events had occurred beneath those steeply sloped roofs. I wondered how many people had been born and died with those walls. I thought about something I had read in a book on the supernatural . It's called the tape recording theory. In essence, it suggests that inanimate objects, such as buildings, can store extreme human emotions. 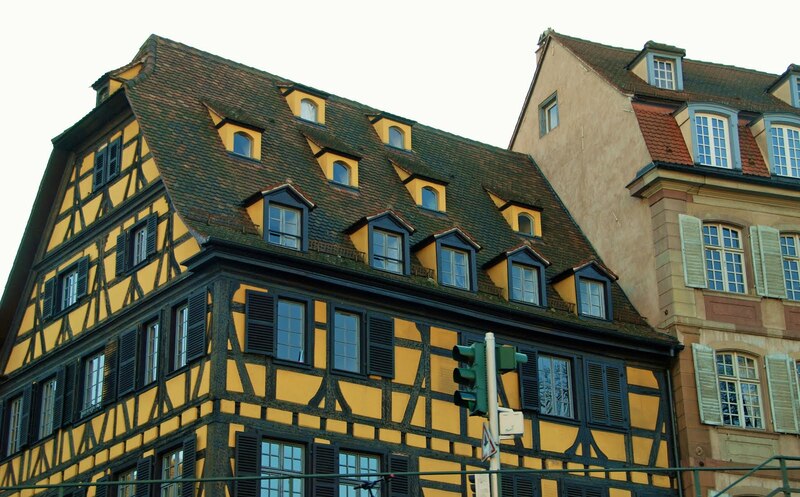 I wondered how many triumphs and tragedies had been recorded in the stones, tiles and timbers of the buildings of old Strasbourg. The hair on the back of my neck moved, as if blown by a breeze, and I shivered. The spirits were beginning to speak. Soon, I would know their stories and Strasbourg's secrets. Our boat moved away from the dock and began its slow, chugging pace down the river. The captain used the intercom to introduce himself (in French) and then began to point out the sights. We quickly arrived at a large brick building with an orange tile roof and dozens of small square windows. I consulted my map and learned it was the Ancienne Douane, old custom building. Although my French is woefully inadequate considering my rather superior status in the ranks of Francophiles, I understood enough to learn that the old custom building was built in 1358 and was used for storing merchandise that had been transported up or down the river. Next, we came to the Maison des Tanneurs, where leather was tanned and hung from the rafters or on the roof of the tall building. The captain's French came fast and furious and I was losing crucial bits of his fascinating monologue. Thankfully, Stephanie's mother, who had accompanied us on this trip, acted as my translator for the remainder of the journey. The boat continued to chug along until we came to a squat yellow house with shuttered windows. Stephanie's mother, Madame Chantal, said it was the House of Regret, a place convicts were brought to eat their last meal before being executed. The House of Regret. How exquisitely mordane, I thought. If the tape recording theory is possible, surely the stones, timber, and glass that form the House of Regret store the extreme, final emotions of countless condemned souls. Next, we came to St. Margaret Prison. Built in 1270 as a hospital for those with scalp diseases, it was eventually turned into a prison, complete with a torture tower. In 1521 the torturer was accused of blasphemy. He was sentenced to death and beheaded. As a final punishment, and a warning to others not to blaspheme, the torturer's tongue was removed from his decapitated head. As Madame Chantal translated more details about the unfortunate end of the blaspheming torturer, I smiled in fiendish delight. Be assured, I am no sadist. I was merely pleased that the spirits had decided to share their stories with me (albeit, using the good captain and dear Madame Chantal as a conduit). We continued circum-navigating around the city, with the captain telling us about Strasbourg's rich musical history. Wagner conducted one of his operas at l'Opéra National du Rhin. Franz Liszt wrote The Bells of Strasbourg, a cantata that pays tribute to the many churches of Strasbourg. And in October 1778, Mozart gave a piano recital and a concert at the Poêle du Miroir (Mirror Street). During his stay in Strasbourg, Mozart also played in the organ at the Temple Neuf church. Next, we came to Raven Bridge. In medieval times, unfaithful wives were put in iron cages suspended from the bridge and dunked in the river, while wide-eyed children watched and women knitted. By the time the boat returned to its berth, we had heard dozens of stories about cheese-making Irish monks, a king with an over-active libido who spent a pleasure-filled evening in the Dragon Hotel, the Zorn and Mullenhein Feud. We heard about plagues and scourges, massacres and murders. I stepped off the boat at the Palais de Rohan feeling bloated with knowledge but still hungry for more. Strasbourg had divulged many of her secrets, but I sensed coyness in her manner. Like an artful courtesan, she had used a fan to reveal and conceal. It would take more than one visit, more than one dalliance with the spirits of Strasbourg, to unearth all of her secrets. I had no idea you were reluctant about the boat tour, I'm so sorry!!! I am going to add this WONDERFUL and so informative article to my website, I loved it! OH, and I LOVE that panoramic of Strasbourg, awesome! No worries, ma petite! My reluctance was typique! I am always reluctant to deviate from a plan, but so thoroughly enjoy myself when I do. First Trier and then the Strasbourg boat tour. You are batting it out of the park, my friend.